This dish has become a well known staple for me (and I have an incredible amount of requests for this recipe!) Now, this isn't my signature, but it's close enough to be considered amazing. 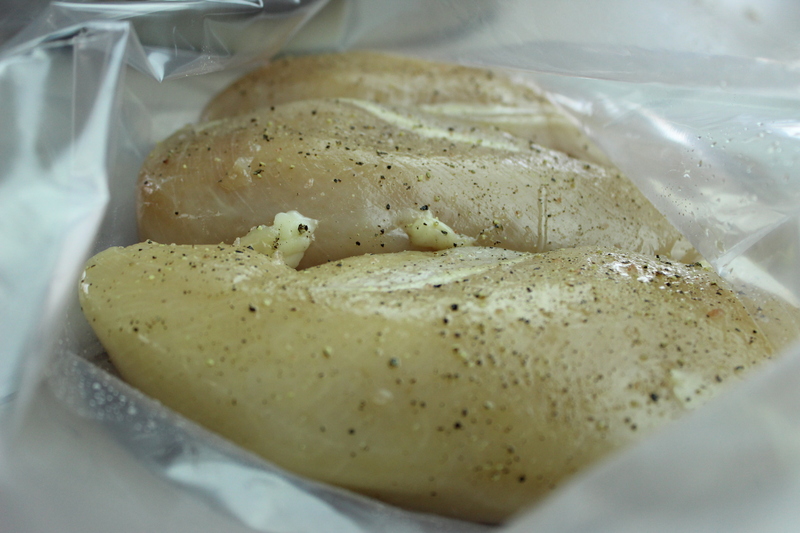 Season the chicken with salt and pepper and place in a large zipper lock bag. Seal the bag using the water immersion technique. Meanwhile, make the honey-mustard sauce: Combine mustard, honey, and chile paste in a small bowl. Season to taste with salt and pepper. Set aside for serving. About 10 minutes before chicken is finished, prepare the oil for frying: Pour 2 inches of vegetable oil into a large Dutch oven. Heat to 375ºF over medium-high heat. Place the flour in a shallow bowl and season with salt and pepper. Pour the milk into a second shallow bowl. When the timer goes off, remove the bag from the water bath. Remove the chicken from the bag and place in the prepared flour mixture. Transfer to the milk, and then return to the flour to coat. Place the coated chicken in the hot oil and fry until golden brown, 2 to 3 minutes. 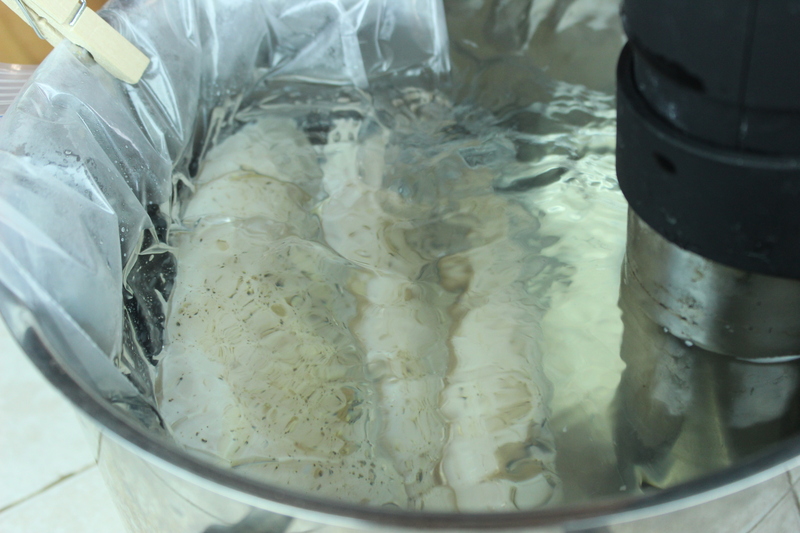 Transfer to a paper towel and let drain for 2 to 3 minutes. Slice the chicken breast in half. Place one waffle half on each serving plate and drizzle with maple syrup. 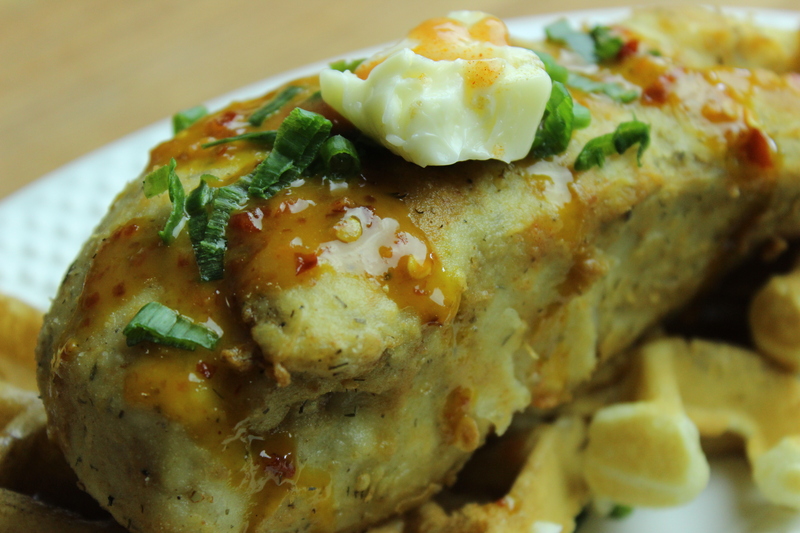 Place one chicken breast half on each waffle. Top with honey mustard. Place 1/2 tablespoon butter on top of each piece of chicken and drizzle Frank's on top of butter. Garnish with microgreens. Serve.